The Ellsworth Dam, owned by Black Bear Hydro Partners, spans the Union River and holds back Leonard Lake. The dam was built in 1907 and supports four hydroelectric generating turbines that provide power equivalent to about 3,000 homes per year. 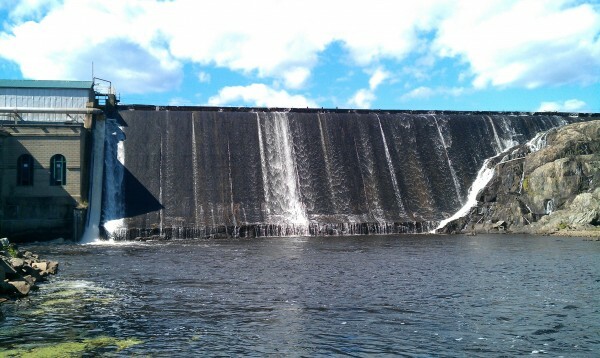 ELLSWORTH, Maine — A hydroelectric company that owns several dams along the Penobscot and Union rivers is beginning the five-year process of relicensing its two dams and one power station in Ellsworth. The existing license, issued by the Federal Energy Regulatory Commission, which oversees hydroelectric power in the United States, was issued in 1987 and expires in 2017. The Ellsworth Dam, built in 1907, spans the Union River and forms Lake Leonard. It houses a powerhouse with four generating units that combined produce 29,907 megawatt hours per year, enough to power about 3,000 households. Farther up the river, the Graham Lake Dam holds back the 9,025-acre lake created by its construction in 1923. The company uses that dam to control the flow of water from Graham Lake to the powerstation at the lower dam, releasing more water at peak usage to generate more electricity. Though the expiration date for the system is five years away, Black Bear Hydro has already begun the preliminary process of collecting information from the municipalities that house the project, including Ellsworth, Mariaville, Waltham and Otis. They’re looking for any clues that might point to potential problems in the licensing, such as existing environmental conditions around the project or known potential effects of the project’s continued operation. Michelle Beal, Ellsworth’s city manager, said there’s no concerns from her end. The city and company have a deal to allow for the commercial harvest of river herring at the Ellsworth Dam’s upstream fish passage, but other than that, the two basically leave each other alone. The project has changed hands several times in the past 25 years, according to FERC spokesman Craig Cano. Bangor Hydro obtained the original license in 1987 and sold the project to Penobscot Hydro, which was later acquired by PPL Corp., which successfully obtained the license in 1999. Black Bear Hydro Partners took over the Ellsworth-Graham Hydroelectric project in 2009, part of a $91 million deal to buy the dam from PPL, along with others in Milford, Orono, Stillwater, Medway and West Enfield. The company is a subsidiary of Boston-based ArcLight Capital Partners, which has a stake in energy generation, transmission and infrastructure throughout the United States and Europe. Despite the long relicensing process — during which the company will have to outline potential impact on soil, water, socioeconomic, cultural, environmental and recreational resources — Black Bear Hydro isn’t expecting any roadblocks.